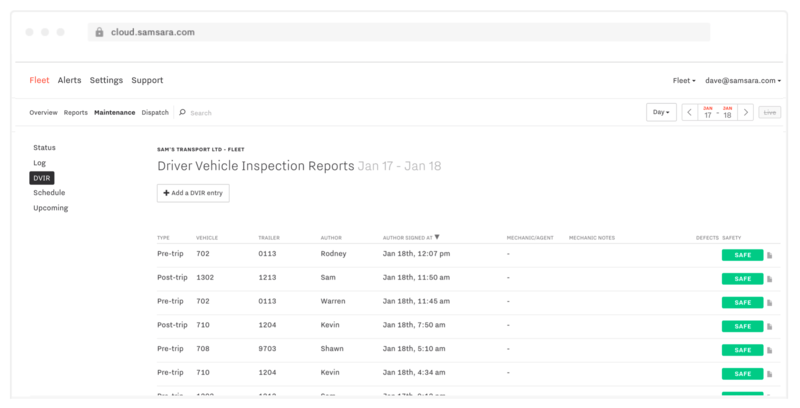 With DVIR, drivers complete inspection reports alongside Hours of Service logs. Fleet managers can review/edit past reports and manage the driver/mechanic signature workflow. To get started, drivers should open the Samsara Driver App and click the green DVIR button. On DVIR view, click Add Report. Fill out the form, including vehicle, inspection type, odometer, vehicle defects, trailer defects.Mark the vehicle safe to drive, sign and save. Sign and submit the report. The report will appear under the Maintenance tab in the Samsara Dashboard. Here mechanics can review all DVIRs, and address UNSAFE vehicles. Once they've fixed a vehicle, they can add a new DVIR noting the fix, mark the vehicle as SAFE, and sign. The next driver to use that vehicle will see the resolved issue when they conduct their pre-trip DVIR. They verify that the vehicle is safe to drive, sign and save.